Situated in the heart of Freetown, the church is part of a school which was left abandoned during the war and reopened in a dilapidated state. 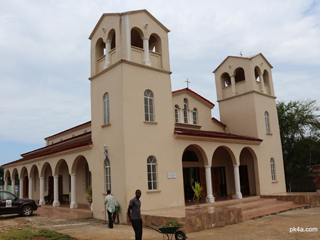 In 2008 the Freetown Council and the Education department handed the operation of the school the Holy Orthodox Diocese of Sierra Leone and Fr Themi. Since the the mission has completed the church and a new school building catering for over 1800 children in Faith, Food and Education. The school and church are always full and more funds are needed to help Fr Themi’s mission to the poor.